Too many people lack a basic understanding of geography. A knowledge of geography helps us put historical events in place. It fosters awareness of different cultures and world events. It helps us know that we are but a SMALL part of this BIG world. 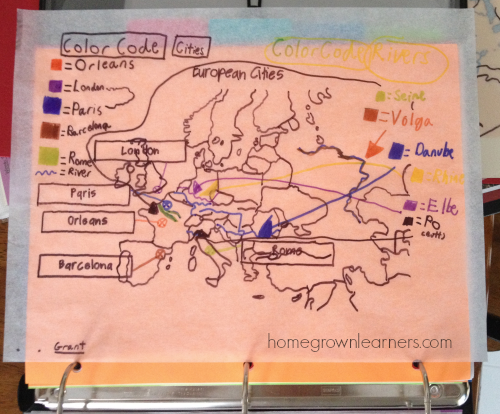 I've been wanting to share with you what my kids are doing for geography, because it can be done so easily. *Grant now claims geography is his favorite subject. I love it! Much of the Classical Conversations weekly memory work deals with geography. Grant (Foundations) is learning small bits of geography each week. Anna (Challenge A) is focusing on drawing parts of the world from memory and learning capitals, features, and geography terms. "My mom bought me TWO pads, not just one!" I thought that was cute. We keep a supply of Sharpies on hand - they really make the maps POP. And, of course, the tracing paper is awesome. I had forgotten how much I loved tracing paper as a child. I keep Grant's maps in a simple folder. The current map is always in the front, and he traces it each day. If he has extra time, he goes back and traces the older maps. When he is finished tracing he punches holes in the paper and puts it in his CC Memory Work binder under "Geography". We download our maps from CC Connected. The user heathergwyn has uploaded the maps we use on a daily basis. A huge box of crayons is also helpful. Some days Grant feels like crayons, other days like Sharpies. 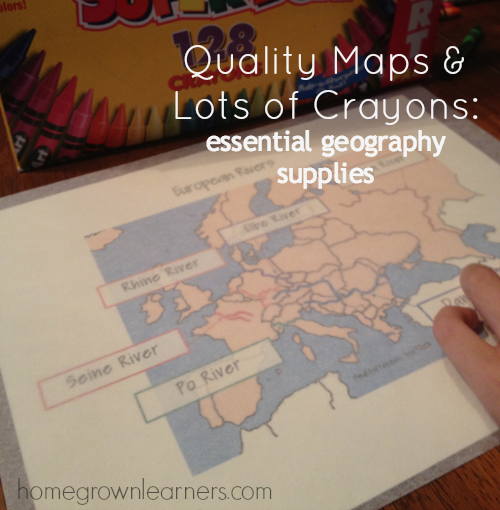 It's good to have lots of quality supplies on hand for you little Cartographers! This is a map Grant traced that shows European cities and rivers (part of our Cycle 2 memory work right now). We save all of the finished products because they take a lot of time and it's great review to look back through them. After several years of methodical tracing and labeling, one day he will be able to draw parts of the world from memory, which is what my oldest (7th grade) is doing right now. Try to sit down and draw just the United States (all states defined), label all state capitals, and major features. Could you do it? I'm so thrilled that Anna can! By the end of the year she will be drawing the entire world. She has already mastered North America, Central America, and the Greater and Lesser Antilles. 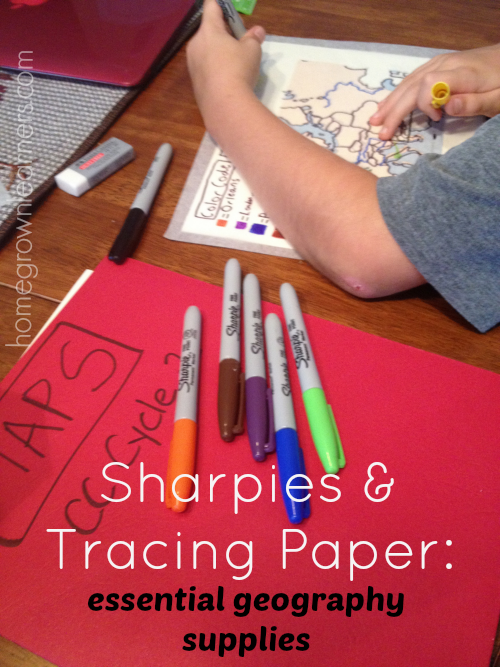 Even if you don't decide to make map drawing an official part of your curriculum, it just might be a good idea to keep the supplies on hand for your child to trace in their free time. Work through the world, a continent at a time, to create a notebook of tracings. If you're learning about the United States, trace each state and create a notebook. You can be so creative with this! I've found this is a wonderful activity for Grant to do when I am helping Anna with something. He's even started tracing LEGO figures and baseball players for fun. I've created a geography Pinterest board - in an effort to catalog my resources! 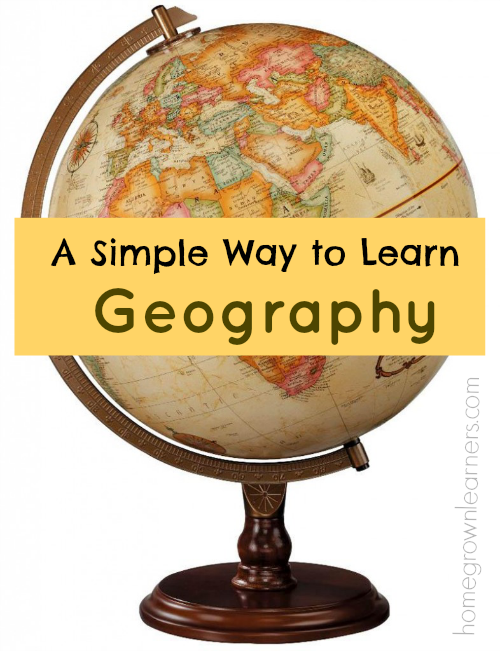 Do you include geography as an official area of study in your homeschool? 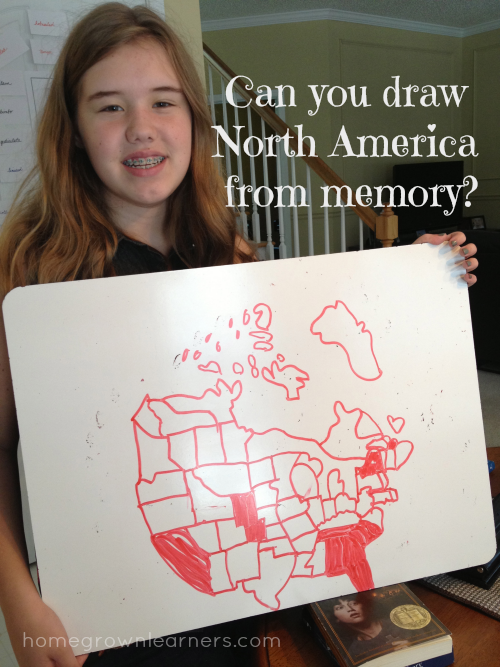 If you are in Classical Conversations, how do you reinforce the geography memory work at home each week? *Below are our favorite geography resources. We own all of these things (the DK Atlas is a staple in our homeschool), and I recommend them to make your study of geography simple and meaningful. We also have three wall maps in our school room, along with a globe. Simple EXPOSURE to maps builds understanding and awareness.